Meandering through the woody landscape amidst the forests of Karnataka is the Cauvery – the ravishing and sacred river of South India. The river offers opportunity to both nature lovers and angling enthusiasts and every year, nature lovers and angling enthusiasts journey to Cauvery Fishing Camp on the banks of the Cauvery river. Fishing, especially for the mighty 'Mahasheer', the largest tropical sporting fish is the main activity here. Maintained by Karnataka Jungle Lodges and Resorts (JLR), together with the Fishing Department and the Karnataka State Tourism, the Cauvery Fishing Camp comprises of three camps - Bheemeshwari, Galibore and Doddamakali. Bheemeshwari and Galibore (16 km away from Bheemeshwari) camps are meant for tourists, the Doddamakali Fishing Camp (6 km upstream of Bheemeshwari) was developed as an offsite corporate getaway. Bheemeshwari, nestled in the forests of Mutatt lies between the Shivanasamudra falls and Mekedatu falls, on the Cauvery river in Mandya district, is fast becoming a major tourist attraction. Located about 100 km away from Bangalore, it is a very secluded spot and picturesque spot. The Camp offers an adventurous retreat for its visitors along with the serenity of the riverside. The camp attracts tens of thousands of people every year. JLR's eco-tourism project has received several awards for the contribution to the promotion of ecotourism in Karnataka. The camp follows follows a 'Catch and Release' policy. The camp has a professional guide who will guide the tourists to the fishing expeditions. Angling equipment is available on hire at these camps. One can catch Masheer fish weighing up to 45 kg but tourists are not allowed to take the fish home. After the mahseer is caught, the camp attendant helps the angler tie its mouth with a nylon rope, weigh it and pose for a photograph. And, immediately after, the rope is removed and the fish is then dunked back into the river. The fishing camp provides certain basic amenities to the travelers during their stay there. Food is served in the open air dining room. Day visit costs Rs 1,700/- for Indians, 2,500/- for foreigners. Angling is at an extra cost of Rs 1,000/-. Similarly, river rafting costs extra. The angling season starts during mid-November and last through March. Fishing hours start at 6:30 AM to 10:30 AM and then from 4 PM to 7 PM. Besides, angling, people come here for bird watching, wildlife safaris and a gamut of outdoor activities like kayaking, river rafting and coracle rides. Beginners and children can enjoy kayaking in the calm stretches of the Cauvery. Life jackets and helmets are provided but guides may not be available for kayaking so, it is advisable to have an adult accompany children. Adventure tourists can enjoy river rafting on Cauvery during the monsoon season (mid-June to September). Accompanied by guide, the coracle ride is also a thrilling experience. 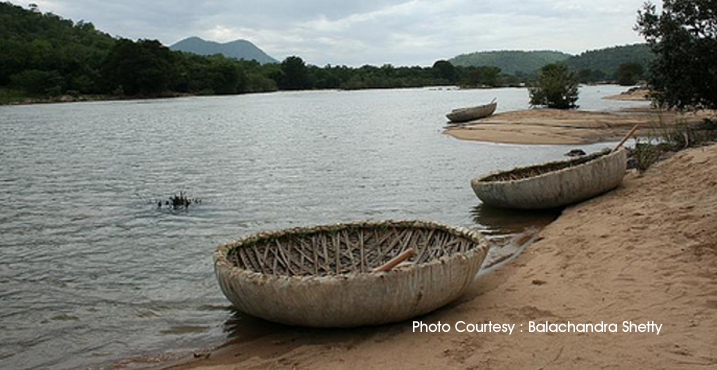 Coracles are saucer shaped boats made out of bamboo, designed to seat two to three. Life jackets are provided. The breathtaking scenery, chirping sounds of birds in the distance etc make this coracle ride unforgettable. During the monsoon months of June, July and August the river is full and the forest beautiful and lush. Best season is from October to February when the rain is less and river will not be flooded., the weather is cool and pleasant and this is the best time to visit the place. It is also the ideal time for bird watchers. Summers (March-June) are generally very warm, especially in the afternoons.